DENVER (AP) Scott Brooks took what basically amounted to a late-game charge. That’s right, the coach of the Washington Wizards. Brooks stepped onto the court after a timeout with 32 seconds remaining and was bumped into by Nikola Jokic, who was on his way the bench. Jokic was assessed a technical foul in a strange occurrence that helped the Wizards to a 109-104 win over the Denver Nuggets on Monday night. Whether it was intentional or accidental by Jokic – or even embellished on the part of the Wizards coach – well, it depends on who’s asked. Bradley Beal ended up making the technical free throw and the Wizards increased their lead to 105-102. Beal then sealed it with a driving layup. After the game, Jokic said he was upset about being pushed from behind just before the timeout and was just making his way back to the Nuggets side. Jokic’s coach had his back. ”I just watched it 10 times. Nikola said he didn’t do it intentional,” Nuggets coach Michael Malone said. ”Nikola is walking off the court. Scott Brooks is walking on the court. There’s contact made. It was embellished a little, to be honest, I think. Beal scored 20 points as all five Washington starters reached double figures. John Wall finished with 19 points as he struggled from the floor (3 of 13) but made up for it on the free throw line (13 of 15). 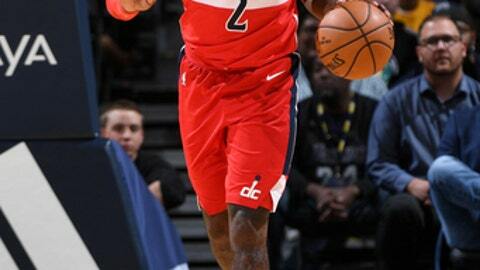 He added 12 assists as the Wizards improved to 3-0. Otto Porter Jr. had 17 points and 10 rebounds. Jokic broke out of a scoring slump with 29 points. His running layup early in the first quarter ended a string of six straight quarters without a point. ”I scored and we lost. Maybe it’s better for me to not score,” Jokic said. Wizards: F/C Jason Smith missed the game in his home state with a sprained right shoulder. Smith grew up in nearby Kersey and went to school at Colorado State. ”He’s been wanting to play well and hit 17 3s against them, but it’s not going to happen tonight,” Brooks said. ”He will have to save it for next year.” … F Markieff Morris missed the game as he recovers from sports hernia surgery. … Kelly Oubre Jr. had nine of his 14 points in the fourth quarter. Nuggets: F Juancho Hernangomez was out with an illness. … F Richard Jefferson dressed but didn’t play. He signed a one-year deal last week. … F Paul Millsap finished with 17 points. … The Nuggets have dropped three straight to the Wizards. … G Emmanuel Mudiay had 15 points off the bench. The Wizards took advantage of 24 turnovers and finished 26 of 28 from the free throw line. ”John Wall is in attack mode every minute he’s on the floor. He’s playing downhill, playing north-and-south and getting to the basket. … We have to show a crowd to him all night long, to take away those driving lanes.” Nuggets coach Michael Malone said of stopping Wall. Wizards: At the Los Angeles Lakers on Wednesday for their second contest on a four-game West Coast swing. Nuggets: Play in Charlotte on Wednesday against Dwight Howard and the Hornets.